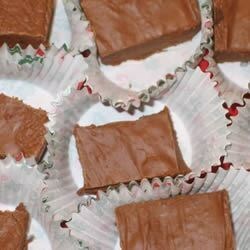 "I have had this recipe for years; it makes an especially creamy fudge. Store in a tin box." Butter two 9x9 inch baking pans and set aside. Place chocolate chips, German chocolate, marshmallow creme, and nuts into a large mixing bowl. Set aside. In a 4 quart saucepan, combine sugar, salt, butter, and evaporated milk. Stir over low heat until the sugar dissolves. Bring to a boil, and cook for 6 minutes. Pour boiling syrup over ingredients in bowl, beat until all chocolate is melted. Pour into prepared pans. Let stand a few hours before cutting. Wow....too easy!! My first try ever making fudge, and turned out soooo good! I cut up, and added 6 Snickers candy bars, rather than the nuts. This was a complete crowd pleaser...THANKS! Excellent recipe. Very creamy. Not boiling the chocolate with the milk and sugar makes all the difference. So easy to make. Hasn't failed me yet!